Our Little Inspirations: Got Cookies? Today I have a card for the Crafting By Designs challenge which is to use 3 or more layers. 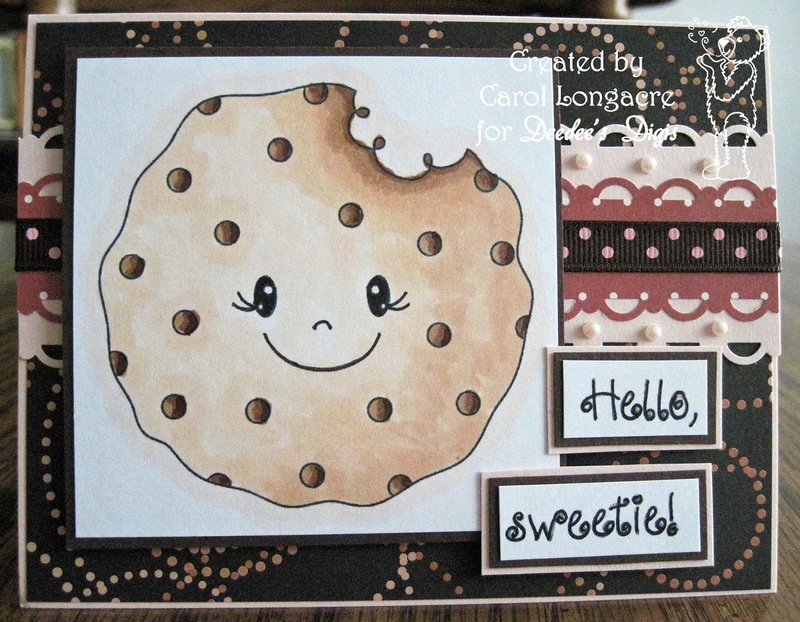 Since Deedee's digis is sponsoring this challenge I used an image from Deedee's digis "sweet treats" digital stamp set for my card, choosing the line version and coloring it with Copics. I used a pale pink card base, adding chocolate cardstock, a swirled snippet of dsp, and a polka dotted piece of dsp done with a fancy scalloped border punch. I added some pink and brown polka dotted ribbon and cut the sentiment into separate words. For the final touch, I added some Kaiser pastel pink pearls. Deedee's August progressive free-for-all challenge is celebrating it's birthday this month with a free digi, so check the details HERE and come play along! Thanks for stopping by and I wish you a great week ahead! Very nice card with all your pretty layers, but that cookie is staring straight at me and calling for me to have one. Seeing as how I just made a batch of chocolate chips cookies yesterday I think I'll have a pre-breakfast cookie. This is all your fault, Carol. LOL Have a wonderful day. 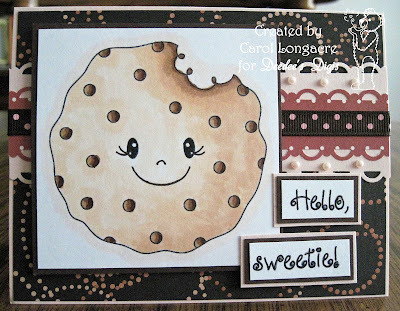 A brilliant card Carol - your cookie looks good enough to eat! Oh, this chocolate cookie is so fun and cute!! The dotted ribbons and the pearls match so well with the cookie! Your card is vey pretty! Cookies! Certainly a favorite of mine! I crave them too much! cute card, colors and layout! great coloring! A lovely fun image Carol, and lovely dps and colours too. aH HA! You can't go wrong with a cookie. That is a fabulous card and great papers!